Did You Know Yay Clay! Was Featured In Her Philly? It's absolutely true! Yay Clay! 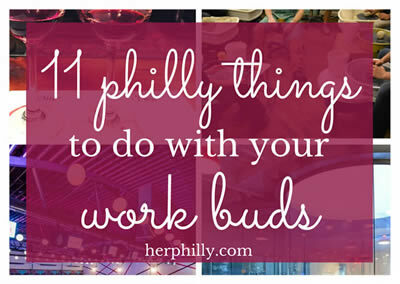 was listed #2 in the "11 Philly Things to do with Your Work Buds" report and we couldn't be more excited. YAY CLAY! is proud to have worked with and been featured in some of the most visible networks and brands in the community. Last week we went back to YAY CLAY! STUDIO in Port Richmond. Clay and pottery classes for toddlers can be hard to find so I was so glad to learn that not only has YAY Clay! been thriving but they have expanded into a new and bigger space. In our original review I called YAY CLAY! one of the citie’s best kept secrets. Even though it is no longer a secret (I hope we helped with that) it is still one of the best “out of the box” options for kids and families. We love when our YAY CLAY! guests post awesome videos. Thanks again for joining us and sharing your memories and masterpieces. A typical Philadelphia-area Dad's Night Out could usually just mean watching an Eagle's game, or grabbing a drink with friends after dinner. But here's a far better list of unique ideas where Philly dads can enjoy some quality time & brotherly love! Do You Know What BillyPenn Knows? It’s getting to be around that time of year when everyone realizes it’s almost summer and starts dropping loads of cash on semi-irrational things like music festivals and beer gardens and unlimited mimosas. Hopefully Billy Penn can help with that. A little.r. Great experience, just didn't like the drug needles on the way in and the urine in the elevator. It’s a great place for a Birthday celebration. There was a large group of us who went and we had a blast. I highly recommend! My wife and I had a great time and created some things that we use at home. Staff was really friendly and helpful.